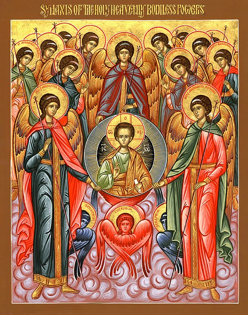 The Archangel Michael Greek Orthodox Church Choir gathers on Sunday to chant the hymns of the Divine Liturgy. In addition, our choir participates in many other feast day liturgies and special occasions as well as other church-related activities throughout the year. The choir is a charter member of the Archdiocesan Choir Federation and supports the federation’s various programs and activities. 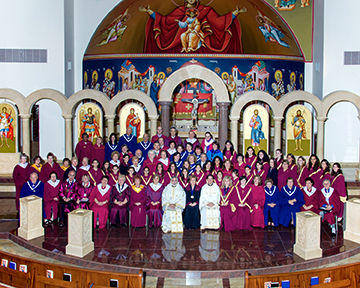 The participation of the choir in the Divine Liturgy is an extension of the role of the prayerful laity who are participants in the liturgy. Many of our choir members do not read music yet we gather together to praise and glorify God in song. If you are interested in joining the choir, please speak with any choir member or e-mail choirs@archangelmichaelchurch.org. Christina Lipinski, Organistany choir member or e-mail choirs@archangelmichaelchurch.org.